A New Mexico man was left battered and bruised after he allegedly tried carjacking a group of football players. According to KOAT, the three players said they saw Angelo Martinez hanging around Loma Linda Community Center where they were having practice. The men said Martinez, 21, tried to talk to them but they had never seen him before. When they left practice, Martinez was standing near their car "acting sketchy as if he was trying to get in." The friends said Martinez told them he needed a ride, so they agreed to take him where he wanted to go. Martinez kept changing his destination, but eventually had the men pull up to an Albuquerque home. Once the car had stopped, Martinez supposedly pulled out a gun and told the guys to get out, KOAT reports. The friends got out of the vehicle, but when one of the guys saw Martinez fumble with the weapon he jumped back in the car and punched the suspect in the face. The other two friends joined in beating up Martinez and subduing him until police arrived. 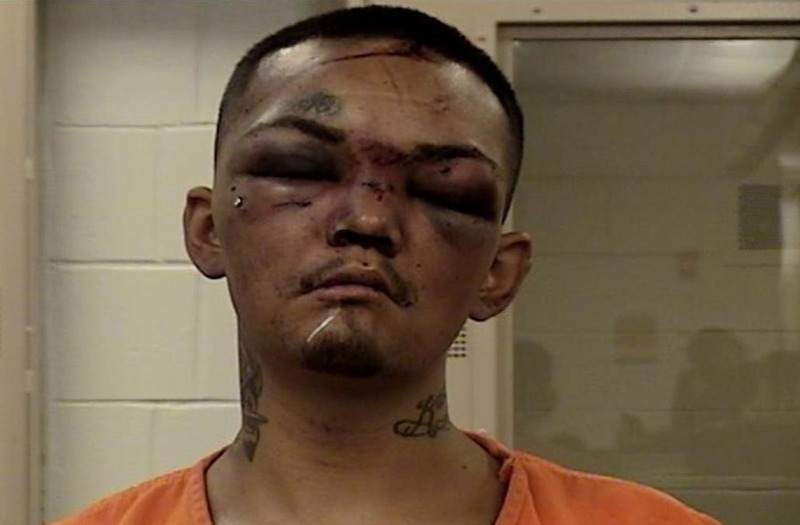 His mugshot photo, taken the night he was arrested, shows him with two swollen eyes, bruises on his lip and nose, and scratches all over his face. Authorities said the gun Martinez was carrying turned out to be fake, but he did have a knife on him. They also said he was carrying a note that read: "Give me the keys to your wip and a nobody get heart. I know where you live so don't make me kill (sic)." Martinez was charged with four counts of aggravated assault with a deadly weapon and attempting to commit a felony, Fox News reports. He was released from jail last Thursday.